The Yankees currently own the best record (31-13) and second best run differential (+81) in baseball, largely because their farm system has been so productive. Luis Severino, Gary Sanchez, and Aaron Judge are all legitimate stars and it sure looks like Gleyber Torres is on a similar path. Miguel Andujar, Chad Green, Jordan Montgomery, Domingo German, and others have come up to contribute within the last year or two as well. Even with all the recent graduations to the big leagues — Andujar exceeded the 130 at-bat rookie limit last week and Torres will do the same in about two weeks — the Yankees still have a strong farm system built mostly around pitching. They’ve turned a lot of mid-to-late round draft picks and smaller bonus international prospects into legitimate prospects. Severino was a small bonus guy ($225,000) and he’s a bona fide ace. Montgomery was a fourth round pick and he’s a legitimate MLB starter. 2016: Taylor Widener (12th round) blossomed into a top 30 prospect and was traded for Brandon Drury. Also, Trevor Lane (10th round) is one of the team’s best reliever prospects. 2015: Chance Adams (5th round), Josh Rogers (11th round), and Cody Carroll (22nd round) are currently in Triple-A and on the cusp of the big leagues. 2014: Montgomery (4th round) and Jonathan Holder (6th round) are big leaguers, and Matt Wotherspoon (34th round) developed well enough to be traded for international bonus money. 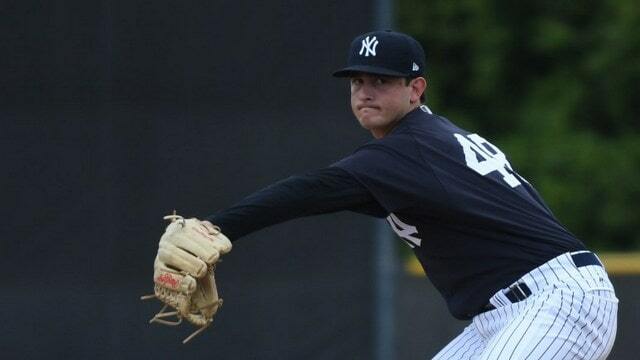 2013: Nick Rumbelow (7th round), Tyler Webb (10th round), Caleb Smith (14th round), and Nestor Cortes (36th round) have all pitched in the big leagues. That’s a lot of mid-to-late round picks turning into useful pieces. Every team turns one or two mid-to-late rounders into useful prospects every few years. The Yankees are doing it year after year though. The high draft picks get all the attention and understandably so, but the mid-to-late round picks are where you build depth, and I’m not sure any team has done a better job turning those non-premium draft picks into quality prospects than the Yankees. Already the next mid-to-late rounder turned legitimate prospect is beginning to emerge. Right-hander Garrett Whitlock, last year’s 18th round pick, currently owns a 0.98 ERA (2.19 FIP) with excellent strikeout (30.2%), walk (4.7%), and ground ball (60.7%) rates in eight starts and 46 innings. He started the season with Low-A Charleston and was promoted to High-A Tampa last week, and threw six scoreless innings in his Tampa debut. There are 302 pitchers in the minors who have thrown at least 40 innings this season, and among those 302, Whitlock has the eighth highest ground ball rate (60.7%) and the 52nd highest swing-and-miss rate (12.9%). Only three of those 302 pitchers have a higher ground ball rate and a higher swing-and-miss rate than Whitlock. In the super early going, he’s shown an impressive ability to get grounders and whiffs. The Yankees selected Whitlock with the 542nd overall pick last year — Baseball America ranked him the 331st best prospect in the draft class — and paid him an above-slot $247,500 bonus for two reasons. One, he was a draft-eligible sophomore with more negotiating leverage than the usual college player. And two, Whitlock was considered a potential Day Two pick (rounds 3-10) before a back problem slowed him last spring. The Yankees saw him at his best in the Cape Cod League two years ago and before his back flared up, and rolled the dice. As an amateur, Whitlock’s best weapon was a two-seam fastball in the low 90s with sink. New York has introduced him to a four-seamer to work the upper portion of the strike zone, and he has shown the ability to carry mid-90s velocity into the late innings. He also has a breaking ball with the power of a slider and the depth of a curveball, as well as a changeup that counteracts left-handers … He has exceeded expectations early in his pro career and has the upside of a mid-rotation starter. Already the Yankees have changed the scouting report. Whitlock was a low-90s two-seamer guy in college and now he’s sitting in the mid-90s and pitching upstairs with a four-seamer. In two years at Alabama-Birmingham, Whitlock posted an 18.3% strikeout rate. In eleven months as a pro, he has a 32.0% strikeout rate. Good health, increased velocity, and a new four-seamer he can elevate for swings and misses explains that. Whitlock has a lower arm slot and a little funk in his delivery — despite that arm slot, his platoon split is not big at all, righties are hitting .172/.209/.264 against him and lefties are at .178/.241/.247 — and who knows whether he can stick as a starter with that arm slot long-term. We’ll find out in time. For now, the most important thing is Whitlock is healthy and he’s taken to his new fastball well, raising his prospect stock. The Yankees blend scouting and analytics very well and, going into last year’s draft, I have no doubt they identified Whitlock as someone who could see velocity gains in pro ball and benefit from an adjustment in pitch selection, specifically mixing in a few four-seamers with all those two-seamers. And so far it is working wonderfully. His back is healthy, his velocity has ticked up, and the performance has been great. Less than a year after the draft, Whitlock is already beginning to emerge as another mid-to-late round success story for the Yankees.